What I love about the holidays are what Rick Warren and his ilk surely consider distractions: the trees, the lights, Santa, and Muppet specials. 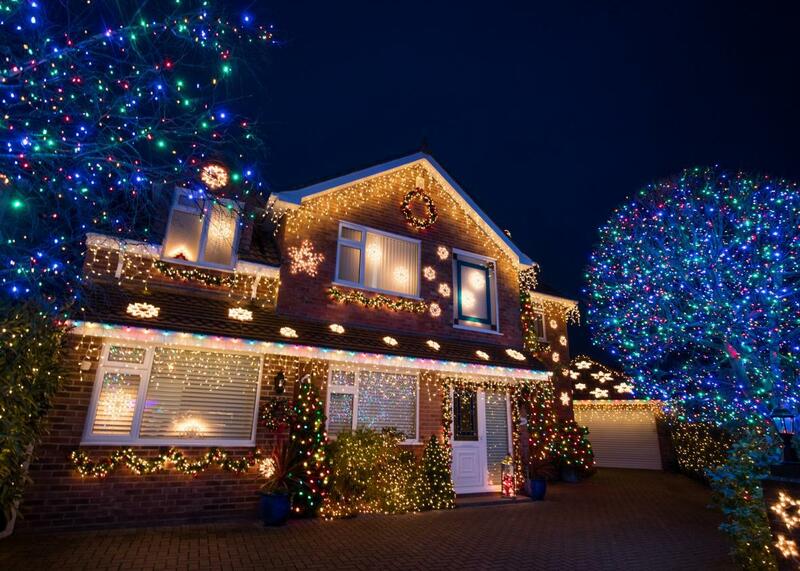 Above, Christmas lights on a home in Somerset, England, on Dec. 14, 2015. Bemoaning the bastardization of the Christmas season is becoming a holiday tradition. In newspaper letters to the editor and in the blogosphere, purists offer chiding reminders that Jesus is “the reason for the season” and that Christmas is supposed to be his birthday party—not a random excuse for shopping and very special sitcom episodes. Adding his voice to the choir this year is megachurch leader and inauguration invocationer Rick Warren, who pleaded in his new book The Purpose of Christmas, “If you’ll slow down for a few minutes … and pause to consider the purpose of Christmas, you can receive and enjoy the best Christmas gift you’ll ever be given.” For Christians, I have no doubt that that’s some sound advice. But I don’t want to slow down and consider the purpose of Christmas. What I love about the holidays are what Warren and his ilk surely consider distractions: the trees, the lights, Santa, and Muppet specials. For me, Christmas has always been a secular occasion. I grew up in an unaffiliated household. My mother is Catholic, though she didn’t practice for most of my childhood. My father was raised in a devoutly Jewish home, but he always adored Christmas. My grandmother tells, half-fondly and half-sadly, of when he was 6 and asked whether he could become Christian so that Santa Claus would pay him a visit. He eventually stopped practicing Judaism, but his love of Christmas never went away. When I was a girl, my father would spend hours decorating the tree, the house, and the yard in a manner a bit like that of Christmas Vacation—lots of swearing, lots of tangled lights, and (eventually) lots of genuine pride in the accomplishment. Each year, one of my brothers or I would accompany him to pick out a new nutcracker to add to our family’s collection; the jester, Drosselmeyer, and Civil War soldiers might not have been part of the Nativity story, but they meant Christmas to me. We never celebrated Hanukkah, because it never appealed to him: Christmas was the only winter holiday worth the effort, as far as he was concerned. My father passed away when I was young, but my family’s holidays remained much the same. We focused on the togetherness and celebrating my father’s memory on his favorite holiday. The miracle of Jesus’ birth was far from our minds. For much of my life, I felt guilt about our happily godless Christmases. I worried that we were leeching off of someone else’s holiday. When Bill O’Reilly railed about “Christmas under siege,” I felt complicit. If I was content to listen to Christmas-themed pop songs instead of hymns, to open presents with gusto instead of heading to church, or to dig right into the meal instead of saying grace, was I diluting the holiness of others’ celebration? Was I insulting Jesus? Cheapening the experience for Christians? There was no one moment that crystallized my thinking or relieved me of my guilt. Rather, it was a series of observations: Most of the classic songs and movies that celebrate Christmas don’t even mention God or Jesus. Santa doesn’t check church attendance to decide whether he’s going to give a child a present—he checks whether she’s been naughty or nice. He’s the perfect secular judge of moral fiber. To say that the secularists injure the Christmas spirit is much like the claim that two men getting hitched will besmirch the sanctity of marriage. Why should the way I mark Christmas bother anyone? Christians appalled by my secular holiday will no doubt argue that I am depriving myself of the greater joy that comes with accepting Jesus into your heart. But I’m not attempting to take away anyone’s right to go to church or to display a Nativity scene. All I need to celebrate Christmas is a tree, stockings, baked goods, some people I love, and some gifts to give (and, yes, receive). My family is not alone in celebrating a Christless Christmas. According to a February 2008 survey by the Pew Forum, 16.1 percent of Americans are unaffiliated with any faith. For those of us without a religion to call our own, Christmas is the most enjoyable holiday—I’ve always preferred it to Thanksgiving, whose accoutrements and traditions I’ve never been able to enjoy. Professional football, turkey, and Black Friday pale in comparison with the trappings of Christmas. What was the last great Thanksgiving song you sang or movie you saw? Some evidence suggests that Christmas itself was merely a reappropriation of the pagan festival of Saturnalia. If that is in fact the case, my godless Christmas is more an insult to ancient Romans than to Christians. Since there aren’t too many of them left, I won’t let it worry me. The best thing we nonbelievers can do, in fact, is be honest about not celebrating the religious side of Christmas. Each Christmas and Easter, churches have to struggle to accommodate the extra crowds who show up for holiday services. While pews may be partially filled or even deserted on a Sunday over the summer, the holidays see a huge increase in attendance as the CEOs (Christmas and Easter Onlys) stop by. The problem is particularly pronounced in Catholic churches, as Christmas is a holy day of obligation. When holiday church attendance is motivated by guilt instead of a genuine state of religious worship, it creates headaches for everyone—and takes up valuable pew real estate. Instead of sitting in church, feeling uncomfortable and vaguely dishonest, I can spend the day with my family—sleeping late, opening presents, preparing and devouring the Christmas meal, sipping a beer, watching the inevitable holiday Law & Order marathon. Could I do these things at other points of the year? Sure—Law & Order is a year-round pleasure. But only at Christmas do so many of my friends and family also have time off, and only at Christmas can I see loved ones who have scattered across the country. Whether or not you believe in God, Christmas is a time of year when you head home or host guests, a rare occasion for the kind of togetherness that can drive you crazy, fill you with love, or both.